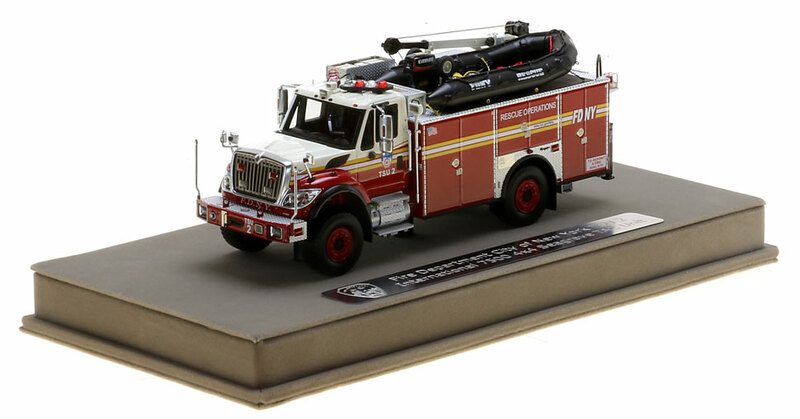 From the marine gear inside the 14' Zodiac to the aggressive details on the International 7500 4x4 cab and chassis, this 1:50 scale replica is authentic to FDNY's TSU 2. 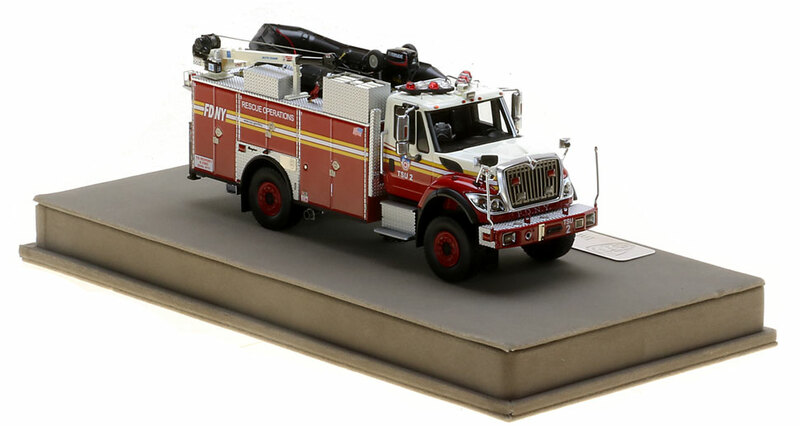 FDNY Tactical Support Unit 2 features impeccable detailing and true-to-scale parts that only stainless steel can provide. Only 100 units of TSU 2 have been produced. Fire Replicas are designed with the elite collector in mind, and manufactured in limited quantities to enhance value. 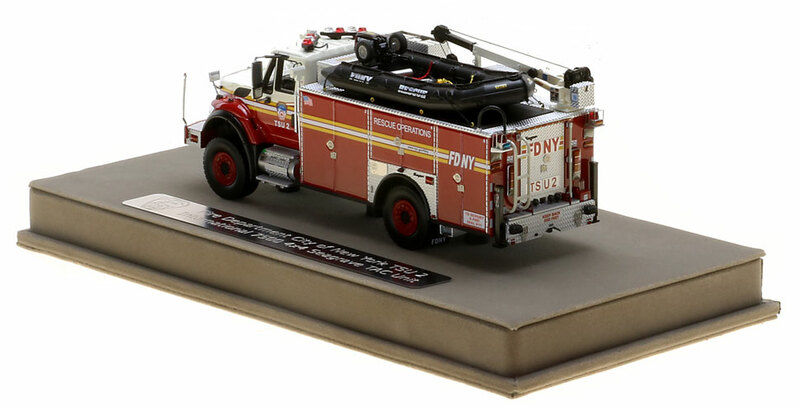 The FDNY TSU 2 measures 6.75"L x 2.5"W x 2.5"T and is securely displayed inside a custom case, measuring 10"L x 5"W x 5"T.
This FDNY TSU 2 scale model is a museum grade replica of the FDNY International 7500 4x4 Seagrave TAC Unit. Like all Fire Replicas models, every detail is modeled to perfection and with razor sharp precision. The replica features the specific department configuration and graphics, leaving no detail overlooked. The display case is custom manufactured with high quality acrylic and resin. The stainless steel etched plate features the department and truck name, and department seal. This replica is a treasure to be displayed and admired and is in no way a toy. One I never thought I'd see! Fire Replicas surprised me when they announced this one given how unique the TSU vehicles are. The details are outstanding and as usual nothing was missed. Glad I got one before their very quick sellouts! TSU 2 is much more than only an addition of a collection. This truck is perferctly built, all amazing Details and great finish. I'd give also 5 stars for only the boat which simply looks fantastic which such a lot of Details. Special Operation trucks are completing the our collection and with the quick sell out of TSU 1 & 2 I'm rather sure we'll see more kinds of such units in the future. Very well done, Fire Replicas! Very nice model. I love it. Another outstanding model from Fire Replicas. The detail on the International cab and the fire truck body is just outstanding. As with other Fire Replica models I have ordered, this has a nice spot in my office for me to enjoy. Well done again.